The is a stable bike providing a smooth ride that will keep going for many years. Electronic instruments show the heart rate using telemetry. Improve your fitness with the Monark 827E Electronic Fitness Cycle!Order your Monark 827E Electronic Fitness Cycle from FitnessZone.com today! 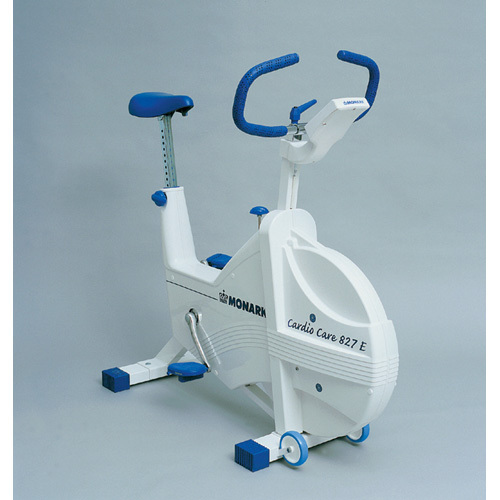 The Monark 827E Electronic Fitness Cycle, also known as the Monark Cardio Care Training Bike, is the leading model for those needing close monitoring of cardiac condition. Designed for intensive use in rehab centers and professional gyms. It features a robust electronic fitness monitor that uses telemetry to track heart rate. Mechanical sliding-belt tension allows for reproducible work loads. Like all Monark Exercise Bikes, the 827E cycle is made to the highest possible standard of quality, performance, safety, and durability. A reinforced, powder-painted, square-tubing frame provides stability and wheels allow for easy transport. The 827E is equipped with a large, well-balanced, 48-pound flywheel that's reliable and smooth, along with an electronic meter that displays pedal turns per minute (RPM), heart rate in beats per minute (HR), cycling time in minutes and seconds (TIME), intended cycling speed in km/miles per hour (SPEED) plus distance covered in km/miles (DISTANCE). The adjustable seat and handlebar, meanwhile, accommodate riders of virtually every body type and age. The Monark 827E Electronic Fitness Cycle allows you to exercise at any time in your own home. Its stylish design, strengthened frame and heavy, completely enclosed flywheel make the 827E a stable, durable stationary bike that requires little maintenance. Call 1-800-875-9145 with any questions you may have. Go to FitnessZone.com to order your Monark 827E Electronic Fitness Cycle. Order your Monark 827E Electronic Fitness Cycle from FitnessZone.com today!